Buried under piles of pulpy, yellowed copies of sci-fi and fantasy lit. Giaco reads and waits. The first Thursday of every month he’ll attempt to review an ancient relic from an ancient time (aka crappy genre fiction from the 70’s and 80’s). Stay with him as you journey into space, caves, voids and dungeons. Unfortunate side effect: from this point on you’ll smell of old books. I found The Atlantic Abomination at one of my favorite used book stores in Philadelphia. Germ Books, now closed for business (travesty), stocked its shelves full of weird, smelly, crappy science fiction. There's something really special about going in to a specialty book shop and picking up a book based solely on its cover. Now, look at this cover, I doubt any one of us could have passed on this gem. What we see is the Abomination himself, looking a bit like a fat blue crab/bird while terrified humans look off to the distance. This, in essence, is the whole story of The Atlantic Abomination, published in 1960. Join me as we talk cold war, aliens, mind control, and bad editing! 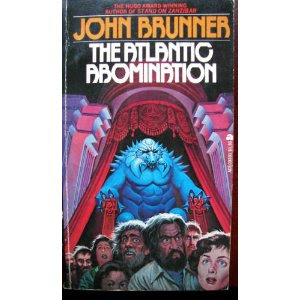 Unlike last month's foray into the strange and wonderful world of genre paperbacks, The Atlantic Abomination is as straight forward as you can get. We first open to Earth 100,000 years ago, and some intelligent life form from a distant planet named Raugh is inflicting pain on human servants. The Earth is falling apart and he's looking for shelter. He runs across one of his own kind who basically says "beat it, punk" and leaves him to die instead of share his shelter. We then shift to "present" day, and this is something that kind of stumped me about the book. There's no set date given, but it seems post-cold war. And the interesting thing about the political climate is that it's "best case scenario" post-war. Technological advances abound and all major countries help each other out without much in the way of goading. Our main characters are three deep-sea explorers, Peter, Luke and Mary. They are able to dive to the bottom of the Atlantic thanks to a new process that helps with the intense pressure down there, and uncover a slime-encased tomb of sorts. Then we go classic sci-fi, as they accidentally awaken the aforementioned Abomination that disregarded its friend in need. Slowly it uses mind control to enslave Luke, and bit by bit returns to its former power. Meanwhile, unaware of this beast's slow return, Peter and Mary get married (truly abruptly) and Luke goes off the radar helping his new master. The monster gains control over humans by using telepathic power to inflict intense mental pain. This is the most interesting aspect of the novel. The monster doesn't tell the humans what to do. He sends a shock-wave of constant neural pain into his victims until they happen upon what he wants them to do. This played out as a very interesting and unique take on mind-control. The beast takes over Jacksonville and builds an army of slaves. Peter is captured and enslaved by the monster. The President and top government officials, along with Mary and some friends from the deep-sea days, all attempt to stop the monster. The ending is nothing miraculously interesting, with some nuclear power and a failed escape attempt from the interstellar monster. My biggest qualm with the book is the editing. In the last forty pages I counted seven typos. It's as if the copy-editor reading over the galley proof got so wrapped up in the climax of the story that he or she missed major grammatical and typographical mistakes! Come on, guys! If you've never read a science fiction book, this would probably be an exciting read. Unfortunately, it is exactly, turn for turn, what you'd expect from the genre. It's classic late 1950's, early 1960's sci-fi: obsessed with issues of mind-control, nuclear power, and the state of the world's politics. As I mentioned earlier, said politics do create a hopeful picture of the world. The U.S., China, Britain and Soviet Russia all seem to be on good terms with each other. Early in the book there's a sense of friendly competition, but when the going gets tough, the U.N. gets its act together. I don't dislike this book at all, but ask me what I remember from it in a year and I'll have to re-read this post. "It was like a migraine in that it was in his head. It was more like the flaying of skin from a body already raw with burning in its savage intensity. He tried to fight it, knowing that others were doing the same, but there was only one way to obtain relief. Act as the monster desired." Have a terrible science fiction or fantasy novel you'd like to see reviewed? Let us know in the comments below!